One of the most enduring challenges in hospitality is leveraging the enormous power of the data available to us. The Guest Data Management Platform provides a clear look into who is staying at your hotel, and how to best speak to them. Featuring a centralized “smart” guest profile database, this is your best course of action for a new approach to guest data. Built on deep integration, Serenata’s Guest Data Management Platform works seamlessly with hoteliers’ data systems. The DMP cleanses existing guest data and enriches the resulting high-quality profiles with additional data, resulting in a new CRM profile for each guest. This includes robust insights into personal preferences, communication methods, stay history, and more, giving you unprecedented control over the information at your fingertips. How does it work? 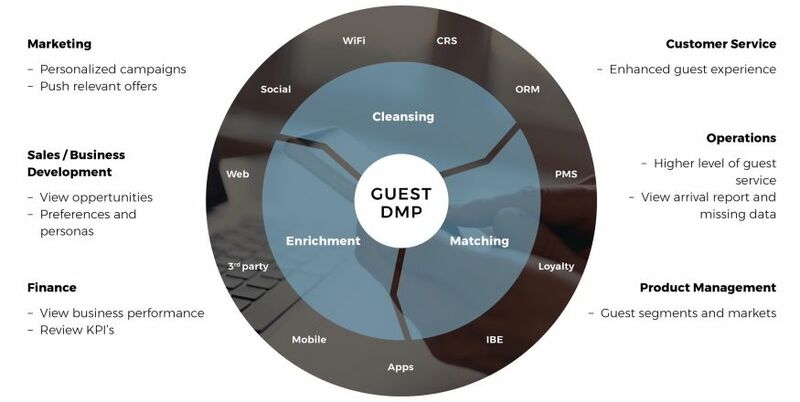 The Guest Data Management Platform (DMP) provides a correct and deduped view of each guest along with a true 360-degree view of the guest profile and relationship – detailed booking/stay history, lifetime value (RFM), preferences and interests, survey and feedback history, marketing campaign history and demographics. This enables hoteliers to truly prepare for and prioritize guest arrivals, “surprise and delight” both first-time and repeat guests and reward guest loyalty. Data that drive our Guest Recognition Manager are sourced from the PMS, CRS, Historical Guest Surveys, 3rd Party Sources and Self-Reported from Guest-Facing Portals and email sign-up/opt-in forms. With our 2-way PMS interfaces, we can also send back this critical information to the PMS for on-property, operational use.